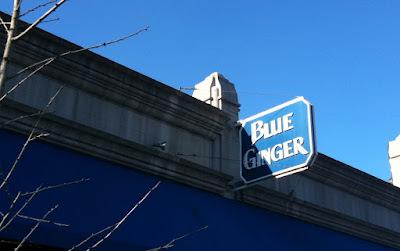 Maybe it was because the first time we ate there we'd just closed on our house in Wellesley, but I've always thought of Blue Ginger as being a very expensive restaurant. So the other day when we skated out of there for$38 (tip included!) after a thoroughly enjoyable lunch for two (in their relatively-new lounge area) I've changed my tune on this restaurant. I think it's one of the best dining values in the Boston suburbs- if you play your cards right. Celebrity chef Ming Tsai's (PBS's Simply Ming, Iron Chef) Blue Ginger is perhaps one of the top things Wellesley is known for nationally (2nd to Wellesley College/Hillary Clinton's time there). It's a gem of a restaurant, originally opened in 1998 and expanded in May 2008 to include private banquets and a lounge area where they're open for lunch and serving Asian small plates. We arrived shortly before they opened at noon on Saturday and enjoyed our very-comfortable table in the lounge area adjacent to the redesigned bar. The seating was thoughtfully designed for this sort of dining- it's not as if you're awkwardly trying to eat food in a bar area. We started with the Sweet Potato-Taro Fries with Chili Aioli ($4). Very nice- hot and crispy on the outside, soft on the inside with plenty of delicious dipping sauce. Tip: This is a great pick for folks looking to satisfy Wellesley's bizarre unique "you can't have a drink without ordering food" law. 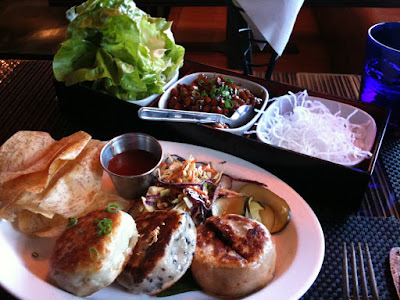 Next, we chose a trio of Ming's Bings ($14)- an Asian dumpling-like interpretation of a slider. Fantastic. You can mix and match a variety of fillings- we chose the Blue "Cheeseburger" with Bacon, the Red Roast Duck, and the Traditional Ginger Pork Scallion. These were the highlight of the meal effectively giving us a chance to taste 3 unique flavors in a single dish. The Asian Slaw that accompanied this was particularly good. Finally, the Blue Ginger Lettuce Cups ($13) were a nice rendition of a dish seen at many restaurants. I particularly enjoyed the slightly crunch texture imparted by the vegetables that accompanied the flavorful stir-fried soy chicken. We had a chance to talk with Deborah Blish about their wine program. She explained their wine selections are a group effort, with Chef Tsai making some of the selections personally. I think the lounge at Blue Ginger represents one of the most unique lunch-time dining venues in the western Boston suburbs. The range of flavors you can sample with a few small dishes is amazing and I highly recommend stopping in. This is top-notch food on a budget. Have you been to Blue Ginger -or- recognize Ming Tsai's name from his TV shows? What do you think?